With charming art and poetry, this honest primer on friendship, and companion to The Thank You Book, captures the many ways friendships are formed and what it means to be a friend. Perfect for fans of I Like You and A Friend is Someone Who Likes You. 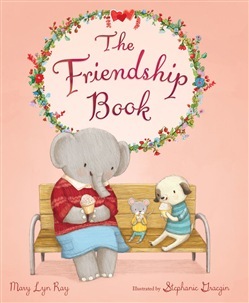 Sometimes being friends begins all at once And sometimes it takes a while, to get acquainted But then, as some small knowing grows, You start feeling that feeling That comes with having a friend— Exploring the many shapes friendships take and how being a friend can be a gift in itself, this thoughtful and authentic primer on friendship invites readers to celebrate the wonders of companionship. Acquista The Friendship Book in Epub: dopo aver letto l’ebook The Friendship Book di Mary Lyn Ray ti invitiamo a lasciarci una Recensione qui sotto: sarà utile agli utenti che non abbiano ancora letto questo libro e che vogliano avere delle opinioni altrui. L’opinione su di un libro è molto soggettiva e per questo leggere eventuali recensioni negative non ci dovrà frenare dall’acquisto, anzi dovrà spingerci ad acquistare il libro in fretta per poter dire la nostra ed eventualmente smentire quanto commentato da altri, contribuendo ad arricchire più possibile i commenti e dare sempre più spunti di confronto al pubblico online.